The March morning was sparkling and fresh, with an unexpected warmth from the sun. You could almost feel the brown and stone-grey landscape soaking up the rays into its roots, stirring dormant life in cold bones. The tide was out in Loch na Cille, and most of the world seemed to have gone with it; far away in the Sound of Jura, tiny islands swam in a silver sea. I turned the handle of the door into the little church and stepped down into the shadowy interior. Even the air smelled old. I had been expecting what I saw, but it still made me catch my breath. 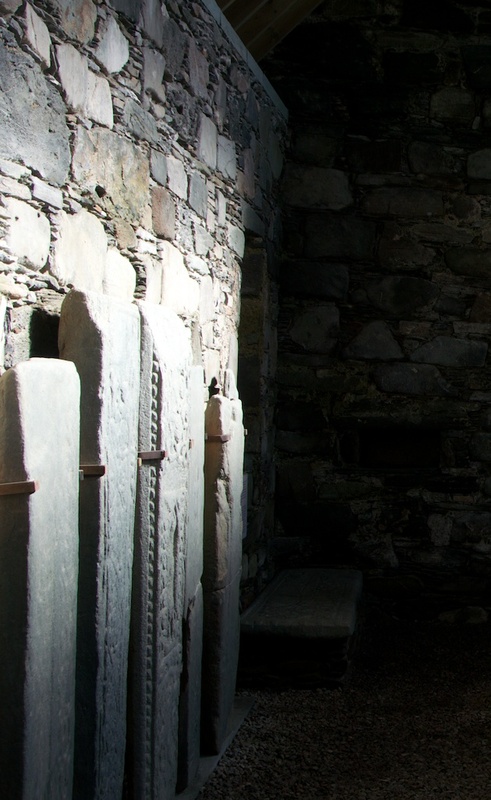 Silent ranks of carved slabs line the walls, and several more are lying on the bare ground. It seems as if each one bears a sword, and for a few seconds their presence strikes you to the core. It could scarcely be more effective if the stones were actually the ghosts of the people whose graves they once covered. And at the east end, facing them all like a gaunt chieftain about to address his knights, is the Keills Cross. 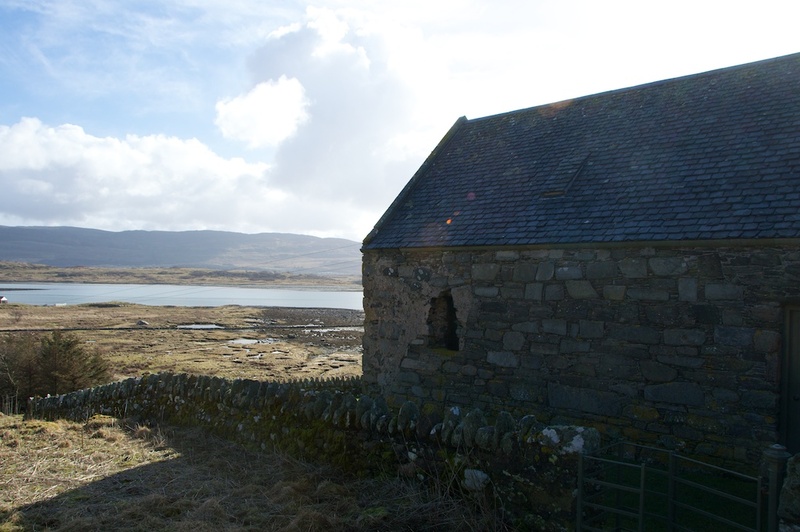 I’ve been somewhere a little like this before, and if you’ve been reading The Hazel Tree for some time, you’ll have ‘been’ with me too: Kilmory Knap Chapel, which is on a parallel peninsula a mile or so across the water. 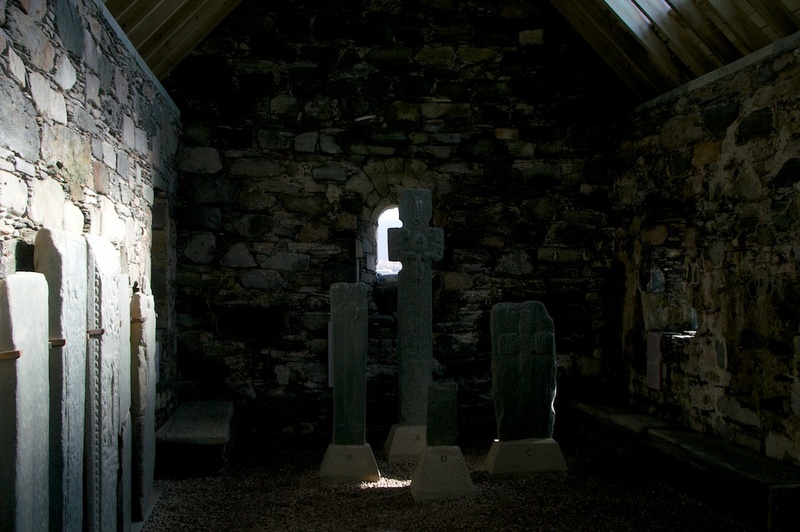 But whereas at Kilmory you are bathed in light from the clear perspex roof, at Keills you are plunged into semi-darkness. There are windows, but you don’t immediately notice them. It’s more compelling, and more mysterious at the same time. Although it feels almost sacrilegious to walk around – there are graves all over the floor – fascination soon gets the better of you. And somehow, you have to get your head around the history of this place, the different eras of the stones, and steal a glimpse of the inspiration behind them. 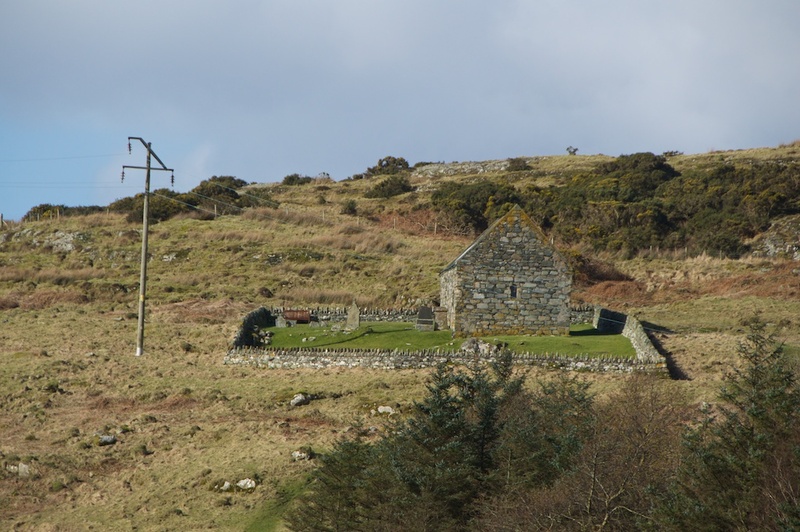 The most likely scenario is this: sometime in the 8th century, a Christian missionary by the name of Abbán moccu Corbmaic (variously spelled Carmaig or Cormac) made his saintly way across the Irish Sea and chose this spot to build a church. 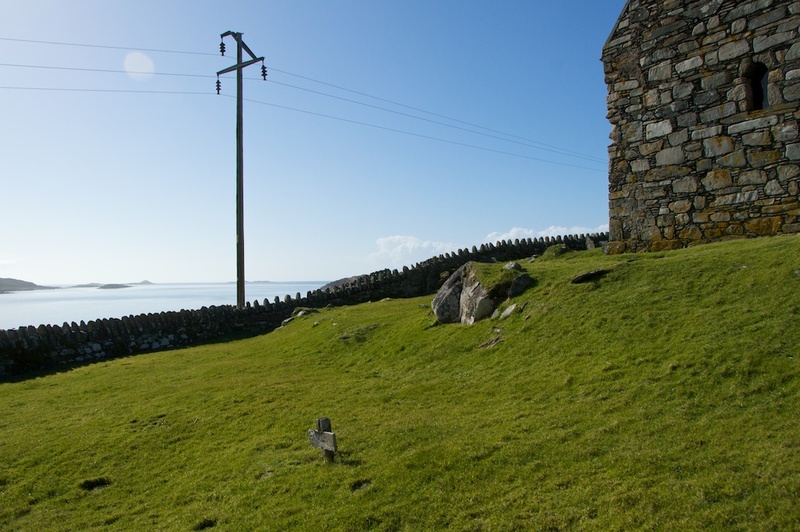 There is no evidence of a monastic settlement, like there is on Iona or the Garvellachs, but that does not necessarily rule it out. 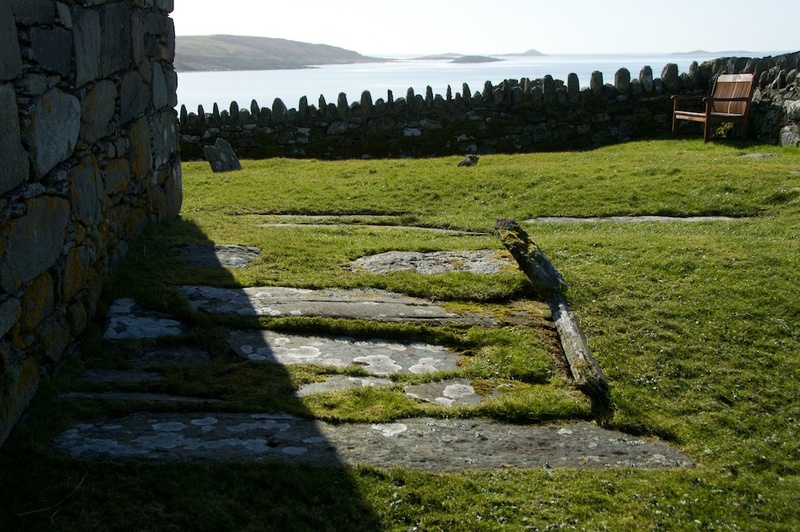 We know very little about St Carmaig, but it is suggested that he may have been of noble descent, and from his early ability to perform miracles his calling in life became clear. It is possible that he took himself to this far-flung spot in order to wrestle with the ‘demons‘ of nature, perhaps in a self-imposed exile. That is something we’ll never know. What does the name ‘Keills’ mean? It comes from the Gaelic ‘cille’, meaning ‘church’. 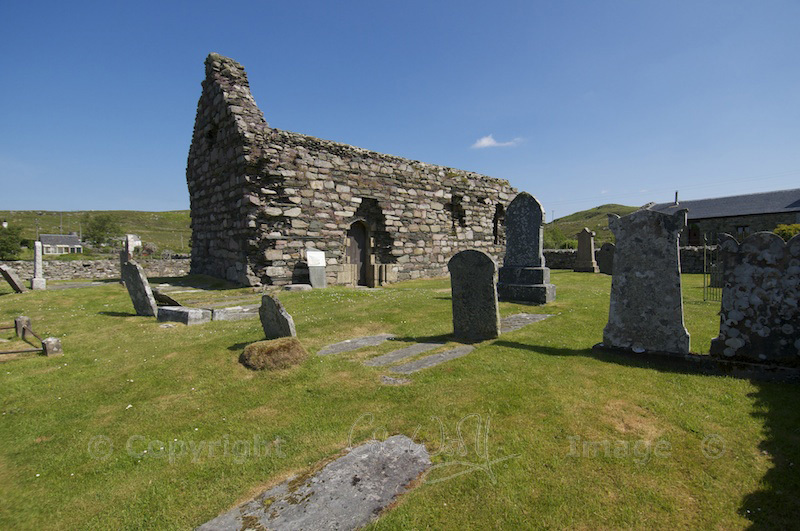 So many place names throughout Scotland have the prefix ‘Kil’ – Kilmartin, Kilbride, Kilmory – which is a clue to an early church. Loch na Cille, which is a spur of Loch Sween, means ‘loch of the church’. The stones that grab your attention first are the sword-wielding showmen, designed to impress, with symbols and adornment squeezed into every square inch. Some of them show craftsmen’s tools, and some bear a portrait of a knight in armour. 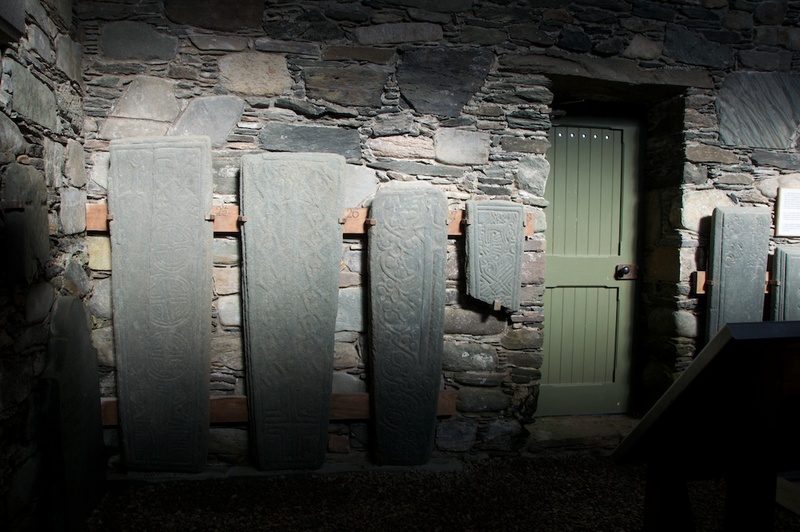 These probably date from the 1300s onwards, and would have covered the graves of clan chiefs, knights, landowners, and possibly their sons and wives. But if there was an code to all this fine tracery, one which might have told us their names, we have lost the key. The stones that speak most quietly are the oldest. Simple crosses testify to simple faith, and hint at a hard life of deprivation and rejected wealth. 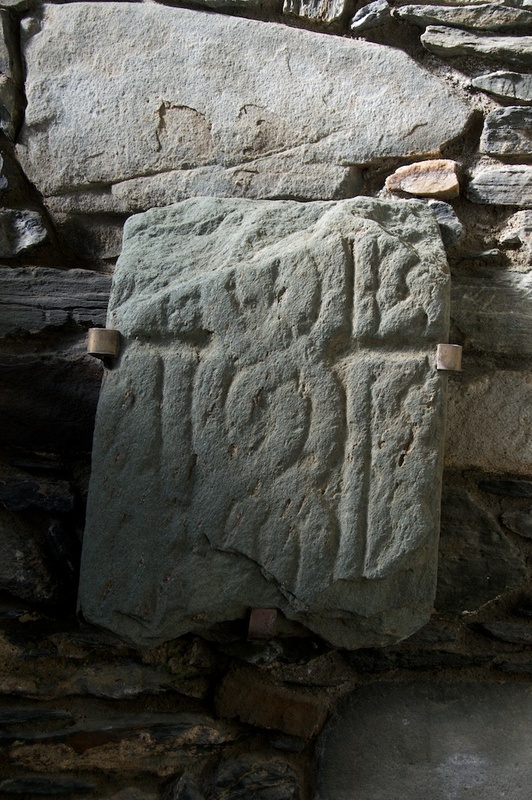 These, and the cross itself, are thought to date from the 8th century. I’m not too hot on church features but I know an aumbry when I see one. There are three in the east wall. 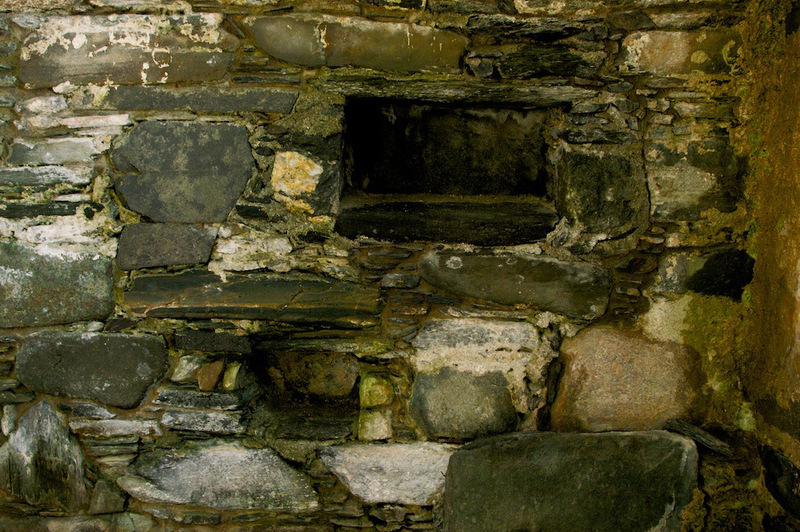 These are cubby holes, the largest about 18 inches wide, and they would have been used for storing sacred relics or perhaps a chalice. The earliest suggested date for the present church building is the late 12th century (deduced from the shape of the round-headed window) but of course there would have been a place of worship here before that time. The walls were originally coated with render, both inside and out, and possibly painted with figures or scenes on the inside. It would have been dark at the best of times, with the only daylight being focused on the altar area by three small windows; but if you try to imagine it lit by candlelight, a more welcoming picture starts to emerge. And as for the Keills Cross, it is like no other that I’ve seen before, mainly because of the shortness of its arms. It is hewn from greenish-grey epidiorite, which is local to Loch Sween. Only one face of it is decorated, which suggests to me that it may originally have had its back fairly close to an outside wall, and was never intended to be seen from both sides; but that is pure speculation. 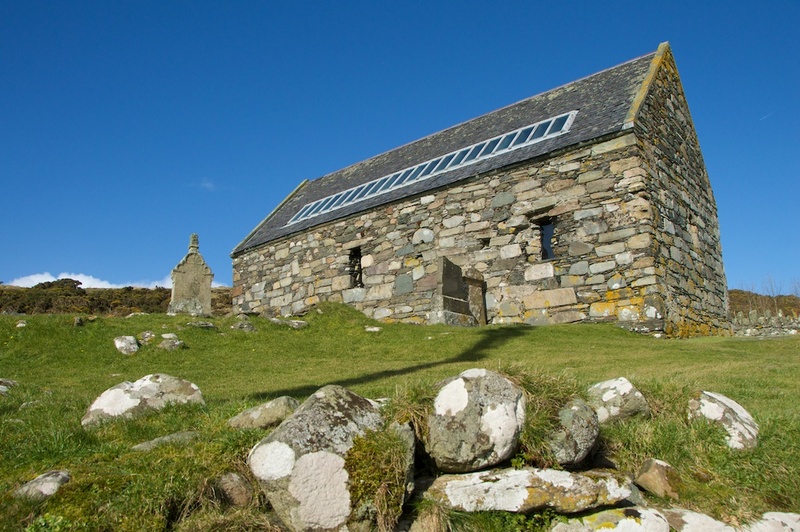 Its last position before it was moved inside in 1979 was about 50 yards or so further up the hill from the chapel, gazing out over the Sound of Jura like a lighthouse. What do the carvings on the cross represent? There seem to be a few differing opinions. The lower seated figure and four beasts may represent Daniel in the lions’ den; or it may depict Christ, flanked by the four evangelists in animal form. He is holding a Bible and either giving a blessing or (according to another source) wielding a flail – in other words, pronouncing judgment. The upper arm of the cross is thought to show St Michael slaying a dragon or a serpent. 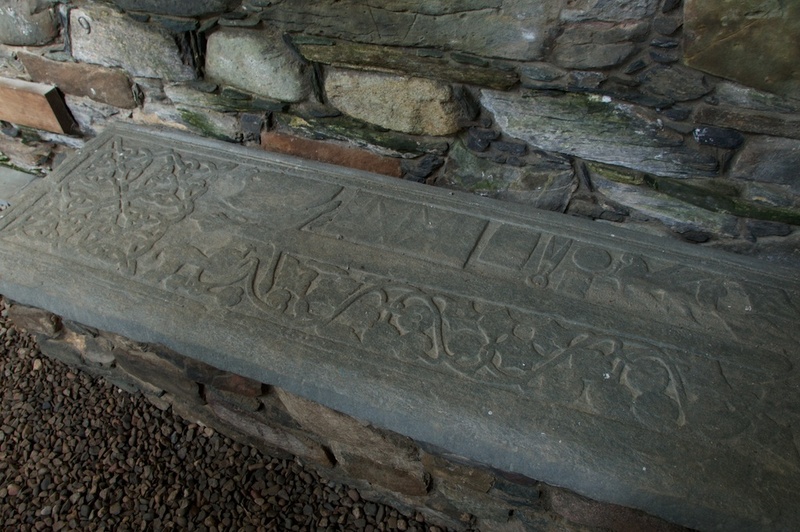 In the centre is a curious nest-shaped carving with three ‘eggs’ – I’ve seen this elsewhere, perhaps on Iona – with the suggestion of the Holy Trinity. Intricate knotwork provides a rich garnish. It is all stunning, purely on its own merits. Overall, the cross stands just over seven feet high and its arms measure roughly 21 inches across. 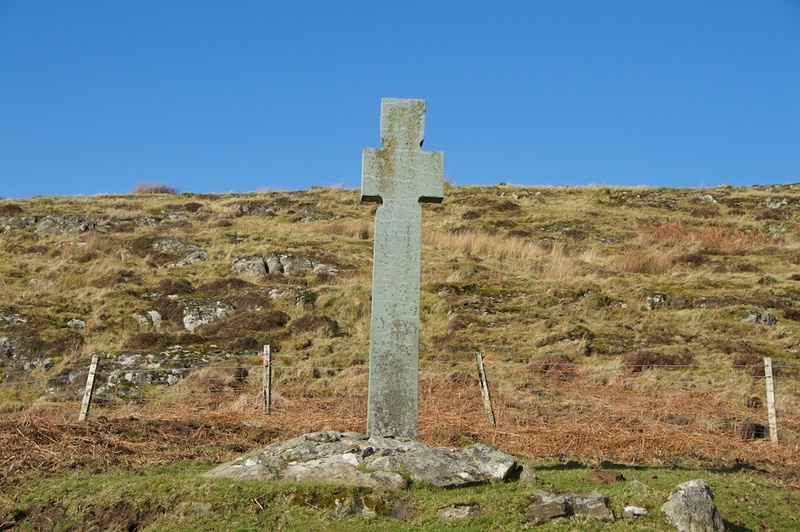 It is older by far than its near neighbour, the MacMillan Cross at Kilmory Knap, and the MacDougall Cross at Ardchattan, which are both 15th century. 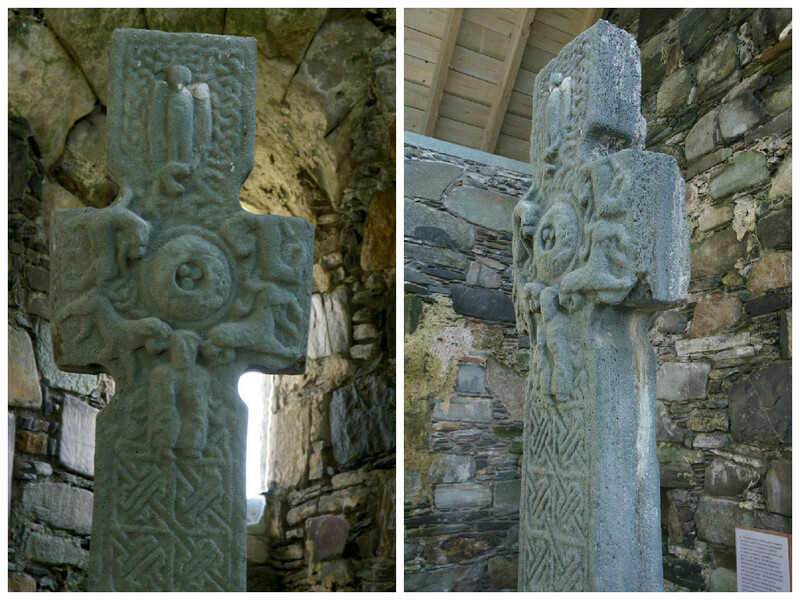 It is, however, roughly contemporary with the beautiful Kildalton Cross on Islay, and with St Martin’s Cross on Iona. A modern replica (but not carved) now stands above the church, overlooking the bay. 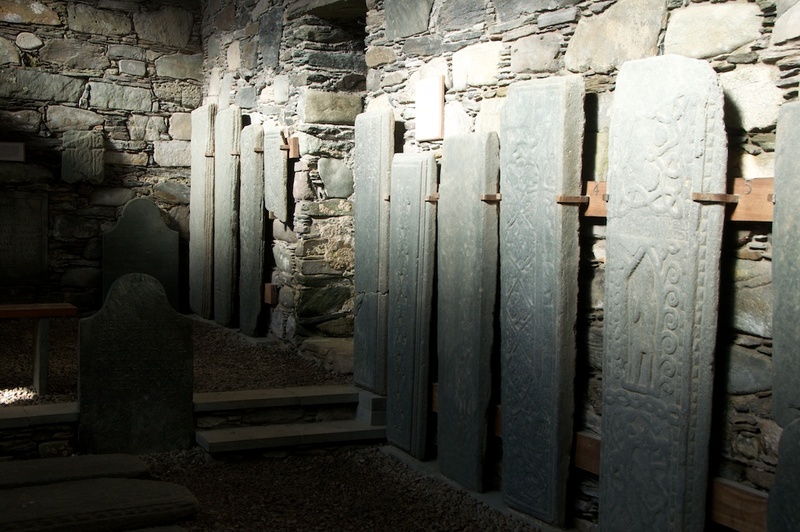 St Carmaig lived in a time of turmoil, and it’s hard to imagine that he wasn’t touched by it. In the late 8th century the great Gaelic kingdom of Dalriada, which stretched right up the western seaboard of Scotland, was beginning to fade into the twilight. 839 – decisive Viking victory over the Picts of Fortriu, paving the way for a new King of Pictland: Cinead mac Ailpin or Kenneth MacAlpin. The dynasties of Dalriada, Pictland and the Britons of Strathclyde would soon merge to become the Kingdom of Alba. Keills was abandoned after the Reformation in the mid-1500s, and fell into disrepair. 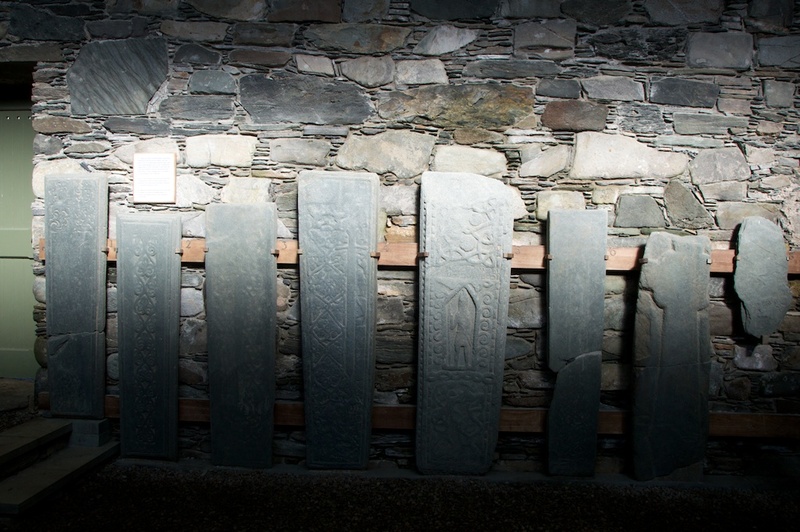 After that, local people chose to bury their loved ones inside the church itself, and a few of these headstones remain legible. A new slate roof was added when the place was restored in 1978, with a row of skylights to allow more daylight in. The floor in medieval times would have been about 18 inches below the present level. 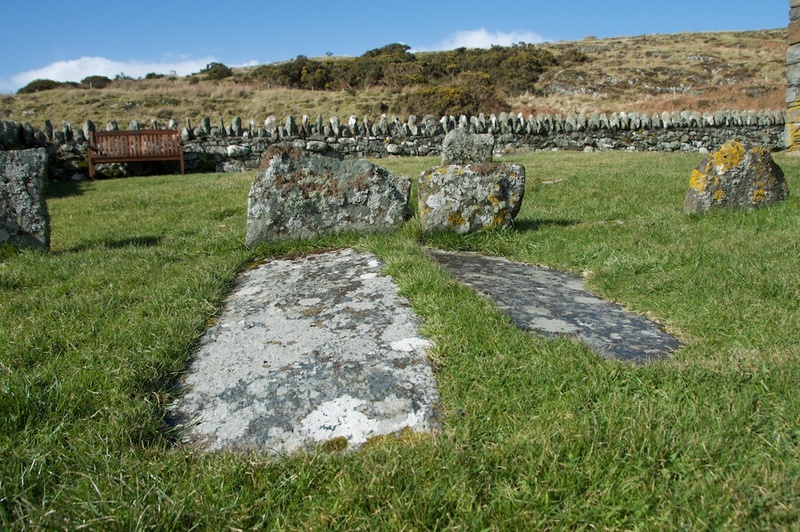 Dotted around the churchyard are a number of graves, some obviously ancient and some surprisingly modern. 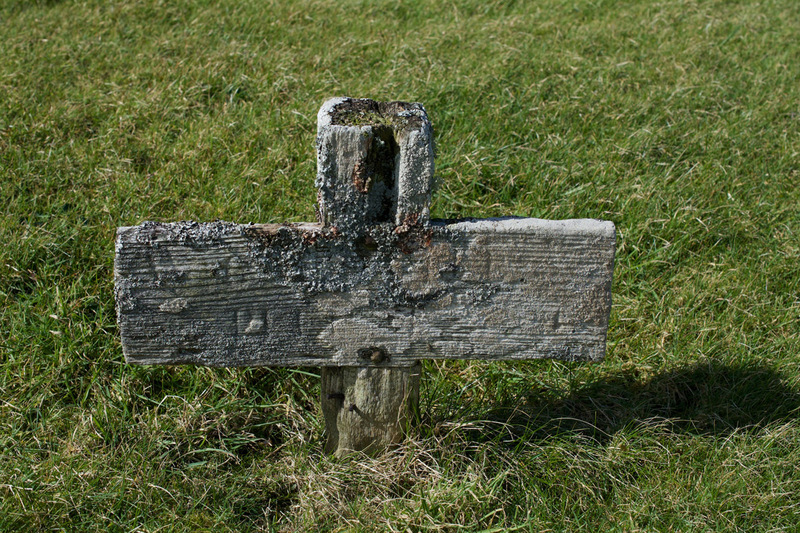 One intriguing feature was a simple, low wooden cross, which once had a carving but is now obscured by lichen. This is probably much more recent than it appears, but I’d like to know what it marks. The view from here is breathtaking, but on a wild winter’s day I can imagine that it would be a struggle just to get up the hill from the shore. And in the distance, specks in the hazy sea, you can make out the MacCormaig Isles, long uninhabited, but offering an essential link in the story of this church. 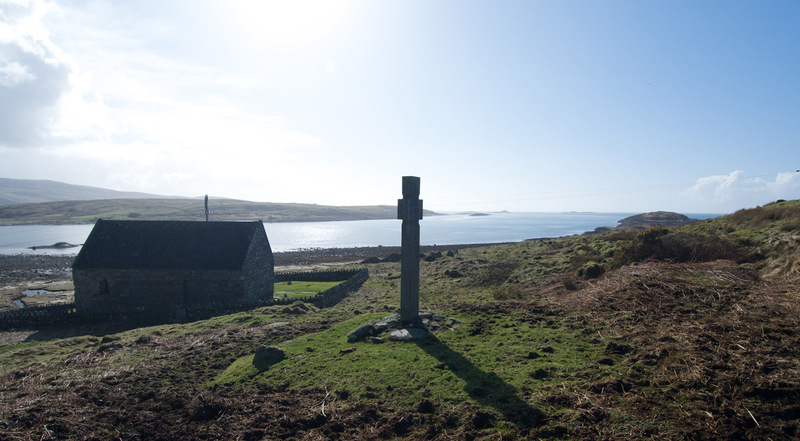 Because these islands, I have just found out, are named after St Carmaig; and on one of them, Eilean Mor, is another church, and a finely carved cross which is said to mark his grave. 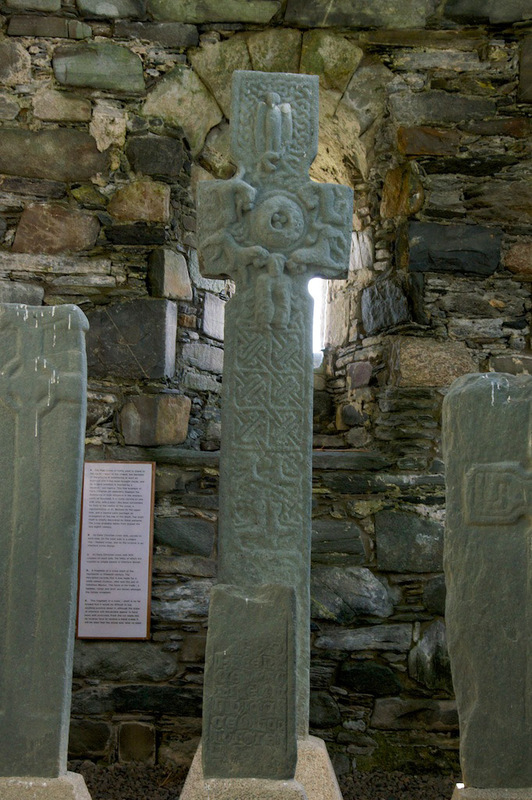 And it was here that St Carmaig chose to build a small monastery. I’m going to have to go there. 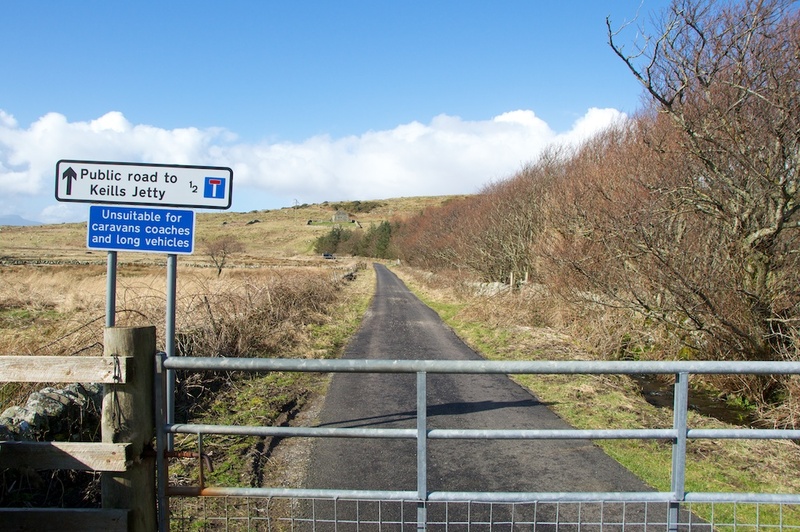 From Tayvallich in Argyll, head down the B8025 towards Keillmore. This is a narrow road with passing places, so don’t expect to get up to more than about 30 mph. Less, if you like stopping to look at plants, birds, rocks or islands! After about 10 miles or so there’s a gate across the road, with a parking area in front. From here, you can walk the last few hundred yards and you’ll see the chapel high above you on the hillside. 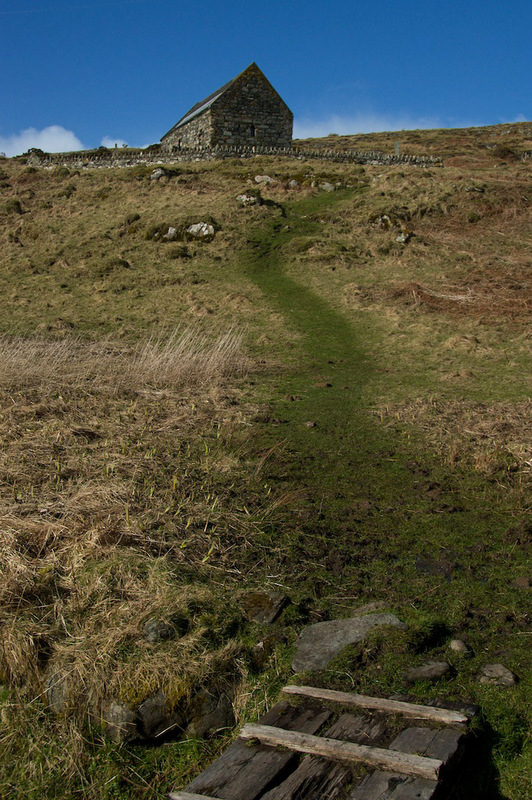 There’s a path up the hill – it’s quite steep, and can be boggy. If you venture further on down the road, you’ll come to a lovely rocky shoreline at Keills Jetty. 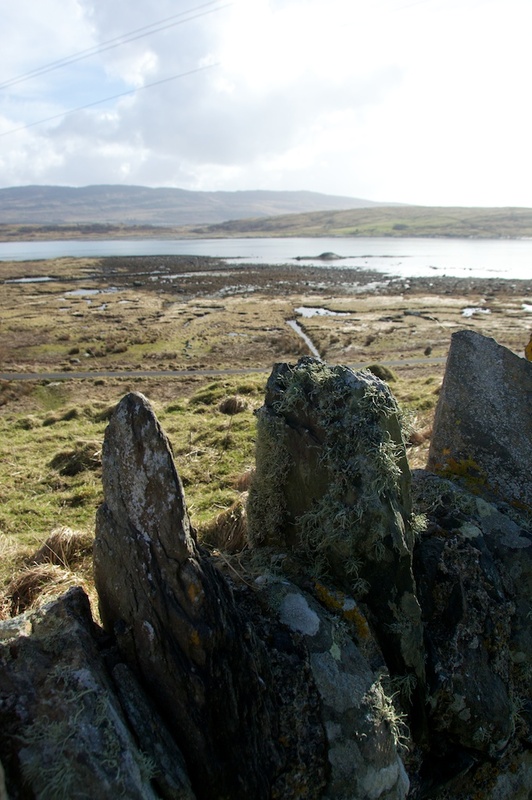 From here, there are fantastic views out to Islay and Jura. Admission is free. More details on the Historic Scotland website. How wonderful Jo! I love the stones. Those islands look very mysterious. Thank you so much for the emails you send out, they give me so much pleasure. Incredibly interesting. I don’t think I’d dmake it up the steep hill, so your account and pictures are doubly valuable to me. I’m glad you found it interesting, Viv, and in that case I’m delighted to be able to ‘take’ you there! Aren’t they amazing?! And the atmosphere is just wonderful. You would love it! I hope you get a chance to go there. The whole of Knapdale is just endlessly beautiful. It’s truly like stepping back in time. What a gorgeous setting for a chapel. Mind you we wouldn’t be saying that on a wet blustery winter day. And when you see the intricate work on the stone slabs you realise how much these folk could achieve without the distractions of tv and the internet. I know, David, on a wild day it would be something else entirely! You are so right about the carving. It must have been a life’s work, gaining a skill to that level. Lovely shots and background story (sorry history)……and another on the to do list when next in Argyll and again reinforces the past importance of the region and the many places to explore there. This whole area is just soaked in history, David, you can feel it when you walk there. Thank you, glad you liked it! Great details about a place that could easily be overlooked or forgotten- thanks for sharing your explorations! What interests me most is the timeline context you give, and the ‘power swings between the Picts and Gaels’-any more info on that topic on The Hazel Tree? Fascinating! I’m enamored of the building stones. All different sizes and shapes. Was any mortar used? Or is it all freestanding? Thank you! I agree, the stonework is so attractive. The chapel looks to be ‘rubble-built’, meaning that lots of different-sized stones were used, and I believe that lime mortar would have been used – there is a note that a render was added over the surface, possibly both inside and out. When we lived in Scotland, we often joked that the farmers grew rocks because every spring there were new ones added to the fences. What a special place: you have brought it to life. This is somewhere I would love to go. Is there not a village named Keills on Islay as well? Thank you for this – and for the word ‘aumbry’! I’m glad you enjoyed it, Christine – thank you. I hope that you can get to Keills sometime, it’s lovely! Yes, I know the Keills on Islay too, and I’d like to bet there was an old church there at one time. Wow! I was transported to another time. One with monks in robes, knights & medieval people. Made me want to watch a history or travel piece on these types of churches or “monuments”. I’m very glad to hear it! 🙂 That’s how I feel too, about these places – they allow you to step inside a little time bubble, if you’re prepared to let go of the modern world for a bit. Thanks for your comment! We are staying in Crinan and (as it was a bit miserable weather yesterday) we went for a drive as far as the gate which you have mentioned. We thought the gate was closed because of the bad weather so turned around and came back to Crinan. So today I googled to find out if we could have ventured past the gate and discovered The Hazel Tree and the chapel – really disappointed to have missed this but thank you so much as I almost feel that I have been there. On a good note, on the way back we had a little adventure and took a left turning at Tayvallich (just to see if there was anything of interest) and came to the coastline and had a fabulous view of Jura – spectacular.